OPEC agreed Wednesday to increase its production quota by half a million barrels a day in an effort to cool high crude costs that have dampened the global economy. The Organization of Petroleum Exporting Countries said its output ceiling will rise from 27.5 million barrels to 28 million as of July 1, and that it will consider another 500,000-barrel increase later this year if prices don't fall. Analysts called the move purely symbolic, since the group already is exceeding the higher quota, and said it didn't ease market fears of tightening oil supplies. The group said it also agreed on a new, larger oil basket — the combination of crude oils that OPEC uses as its price gauge — that would increase from seven types of crude to 11. "I think we are continuing with our protection of the market," said OPEC President Sheik Ahmed Fahd Al Ahmed Al Sabah. "There is enough supply in the market. We are confident we can reach the fourth quarter with enough supply." OPEC spokesman Omar Farouk Ibrahim said the group's 11 members called for "reasonable prices consistent with economic growth." "The market continues to be well-supplied," he said. "However, world crude prices remain high and volatile as a result of concern over lack of world refinery capacity. The situation has been further exacerbated by geopolitical developments." Crude prices have been hovering around $55 per barrel, and the group was working to get them back below $50. But analysts expressed skepticism that lifting the ceiling would give any real relief to consumers or ease market fears of a tightening supply, since OPEC already is pumping more than the level to which the quota would be raised. Oil markets held their gains. Light, sweet crude for July delivery rose 50 cents to $55.50 a barrel on the New York Mercantile Exchange. On the International Petroleum Exchange, July Brent was up 65 cents to $54.38 a barrel. "Today's OPEC meeting is a past story, really," said Peter Gignoux, an analyst with New York-based GDP Associates. "At the end of the day, we have a demand issue, not a supply one." "It's unlikely this will have a major effect in the short-term, as we believe OPEC has limited capacity to increase production," added Daniel Hynes, an energy analyst with Australia's ANZ Bank. Al Sabah said the group had little choice but to do something with prices already high and expected to climb, although he conceded Wednesday that he didn't expect raising the quota to have an immediate effect. Including Iraq, which is not bound by the quota, OPEC is churning out close to 30 million barrels a day, or about 35 percent of current global demand. The group needs to increase supply at the end of July or early August to meet demand in the fourth quarter, which Al Sabah projected at 30.5 million barrels a day. 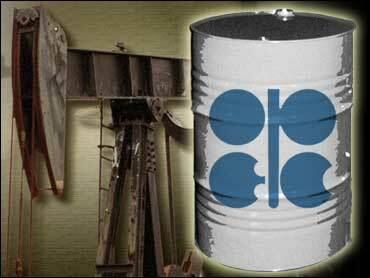 He said OPEC would increase fourth-quarter output to between 30.5 and 31 million barrels. Iran's oil minister, Bijan Namdar Zangeneh, echoed analysts' qualms, conceding that raising the ceiling will have little impact on crude prices. "If you want to be realistic, it means no change in the real situation," he said. Nigeria's presidential adviser for petroleum and energy, Edmund Daukoru, said raising the ceiling by 500,000 barrels a day would go "beyond symbolization." With markets sufficiently supplied, the lack of spare refining capacity was a key factor driving soaring prices, OPEC said. "We have to trace the root of the problem, and that is whether refineries can accommodate" further increases in oil production by processing lower-quality crude, Al Sabah said. "The main problem now is the refineries." Daukoru called the refinery issue a recurring problem, saying: "We come up against this again and again and again." Kamel al Harami, an oil analyst from Kuwait, contended that OPEC is helpless to cool prices. Even if the group adds half a million barrels a day, the oil will be of inferior quality, Al Harami said. "The situation is out of its hands," he said, predicting prices will remain at their current level.